If you’ve been reading my blog for a while, you will know I have written extensively about setting up Writer’s Workshop, Using Interactive Notebooks, Writing for Self Regulation, Author Studies and many other things. Many of these topics are discussed by searching the label Writing Sundays. 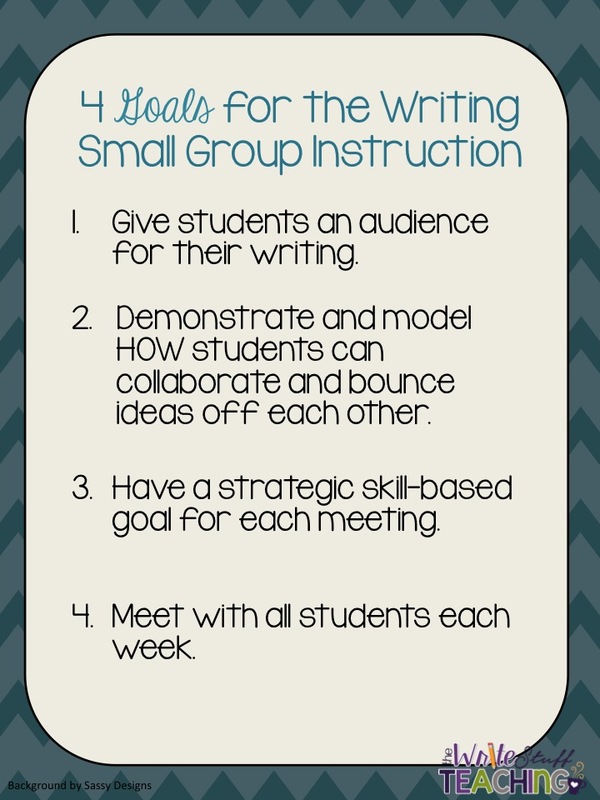 Today I’d like to talk about the benefits of Small Group Writing Instruction with students. We have been using Guided Reading and other small group instruction techniques for years and they are vital to the reading development of our learners. Today, I wanted to talk to you about small group instruction for writers and the trickle down effect of this on many other subject areas. I have had many people ask me how I find time to conference with all of my students during writing time. Some people use data forms and track each and every student and monitor what stage they are at and where they need to go from there. If that works for you – great! Keep doing what works in your classroom and for your students. I do things a little differently as I really find that hard to keep track of. 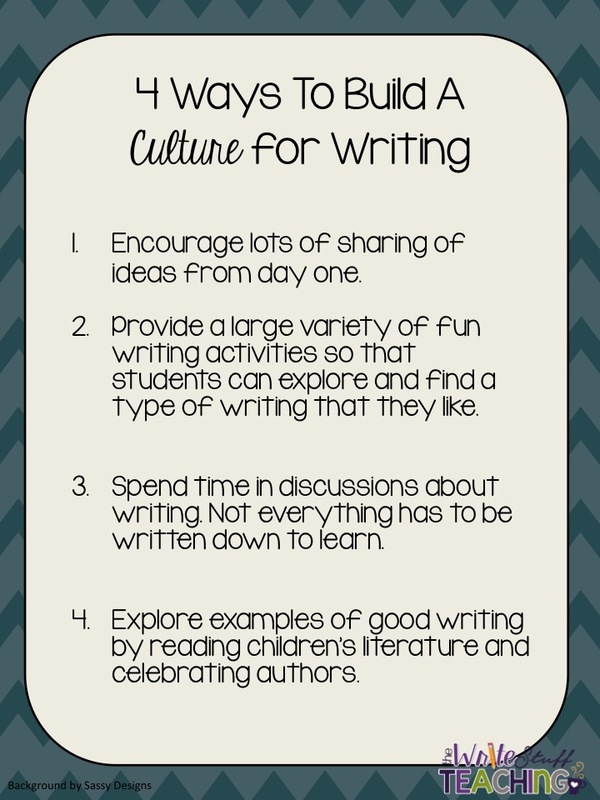 I do mini informal conferences a lot when we are first starting our writing program after we build a culture for writing. At this time, I am focussing on whole class writing strategies and routines. As students write and talk about their ideas as a whole class initially, I am wheeling around on my wheeled stool as they write so I can see what they are writing. We discuss strengths and what they can work on next. Students don’t see this as an assessment because it’s so friendly but it’s a great example of assessment for learning. The beauty of small group writing instruction is that the collaboration is taught and modelled so that when they are writing on their own or with partners, they can use the same strategies and language with their classmates. I love to model the joy you can experience when you share your writing and learn from others. The other beauty of this model for writer’s workshop is that the rest of the class is already busy and engaged on their writing so providing “something else” for the kids not in the group is not necessary. For the next part of this blog series, I will discuss how I group students and the possible “mini lessons” and skill-based lessons you might want to try with a group. Click here for part 2. If you are looking for help setting up a Writer’s Workshop in your classroom, be sure to check out my Writer’s Workshop Binder and Start up Kit. You can click on the ratings and comments to see how successful this resource has been in many classrooms across the country.